‘Big News’, mid-day tabloid from Kalakaumadi group of publication has been released at a function in the Nishagandhi auditorium. 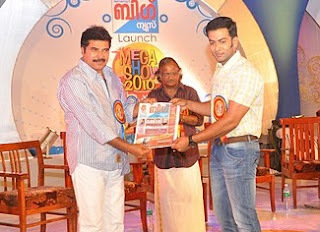 Actor Mammootty released the tabloid, while youth icon of Malayalam film industry Prithvi Raj received the first copy. “This is an age of media demassification and there is enough number of dailies and channels in the state to impart news to the people. I hope ‘Big News’ will be different among them all and will develop a constructive journalism proclaiming truth as its main objective,” said Mammootty. Kalakaumadi Group has been in the publishing industry for around 30 years and they have got a number of publications on various genres. The literary publication of the group, ‘Kalakaumadi’, braved many hardships during the period of Emergency and it is now regarded as one of the best literary magazines in the state. Lyricist Sreekumaran Thampi presided over the function, while Sukumaran Mani, Chief Editor of the tabloid, welcomed the guests. Lyricist Bichu Thirumala, actors like Meeran Nandan, Manikyam Mythili offered felicitations.